One day while I was in Austin, my brother came home from the grocery store with some green beans, mushrooms, and tomatoes. "I figured we could do something with this for dinner," he said. He then proceeded (with some input from my sister and me) to cook the beans, tomatoes and mushrooms up with some onion, thyme and basil, and threw in some red wine vinegar at the end. We decided it would be good with couscous (we'd already recently had rice and pasta). At the last minute he hard-boiled some eggs for protein. My brother wasn't completely happy with the results. I thought it was pretty tasty and had potential. So Friday night I was at the grocery store here in Chicago and they had green beans on sale. Hmm, I thought. I could play with Pete's recipe. I didn't feel like using mushrooms but wanted another vegetable. Zucchini seemed like a viable option, but they were all wrinkly and didn't look so good. I thought of spinach, but thought it might disappear too much. Then my eye fell on a perfectly proportioned bok choy. Definite possibility there. I picked up some fresh basil and lemon and headed home. I was very pleased with the result. The green beans and bok choy went very well together (although I would definitely make it with zucchini for a change). The fresh basil gave a hint of anise flavor, and the lemon brightened freshened up the beans and bok choy beautifully. Speaking of lemons, I've come to appreciate how wonderfully they freshen up a dish. If I had to choose between red wine vinegar and lemon (excpet, perhaps, with Gazpacho), I think I'd pick lemon from now on. Heat oil in large skillet. Add onions and saute app. 5 mins., until translucent. Add green beans, salt and pepper and cook another 5 mins. Add bok choy stems and cook another 5 mins. Add bok choy leaves and cook another minute or two, until leaves are barely wilted. Add tomatoes and thyme and simmer app. 10-15 mins. more. While mixture is simmering, bring 2 c. vegetable stock to a boil. Turn off heat, add couscous, stir, cover and let sit for five minutes. Just before serving, add basil and lemon juice to green bean mixture. Fluff up the couscous. 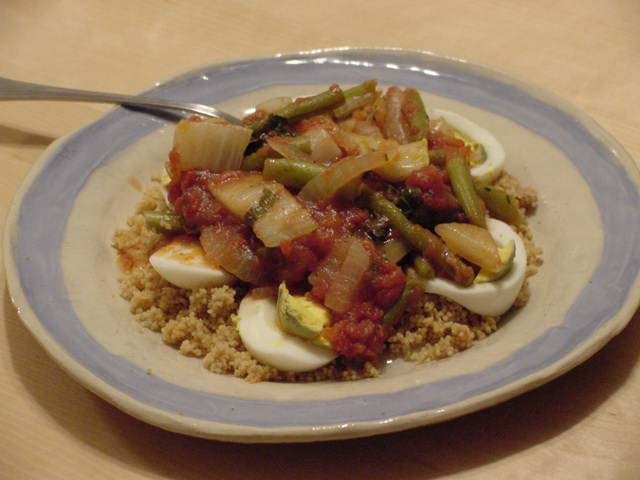 To serve, place couscous in a bowl, then a sliced hard-boiled egg, then the green bean mixture.